Osmonics was purchased by GE a few years back. We still carry the full Osmonics sediment filter line and have found them to be some of the best sediment filters on the market. I will take you through the line which goes from Puretrex Hytrex - Selex - Flotrex - Memtrex. The Puretrex is an economical filter that is great for prefiltration on reverse osmosis systems, under sink drinking water systems and other low flow applications. Puretrex is not recommended for whole house applications. The particle retention is not good at higher flow rates. The Hytrex is a step of from the Purtrex in two ways; higher flow rates and better particle retention. This is a great filter for whole house systems and industrial applications. The Selex is a high end filter for home systems and entry level for laboratory and high purity water applications. 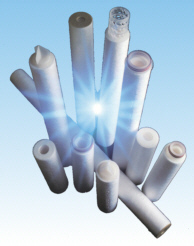 The Selex is available in a 1 micron absolute which we have found to have significantly better removal of smaller particles than either the Purtrex or the Hytrex. The Flotrex is often used as prefiltration in reverse osmosis systems that are in a food or beverage plant or as the second to last step in a bottle water process. You would run Flotrex, then ozone, or Flotrex then Memtrex. Flotrex filters are also use as prefiltration in laboratory, pharmaceutical and other high purity applications. Memtrex is for final filtration. If you use a memtrex filter without prefiltration it will plug very quickly. Memtrex is the top of the line in build quality, materials offered and particle retention. It is used for final filtration of food and beverage products, bio-tech, pharmaceutical production, bottled water and other applications that require 5 log reduction capabilities. GE Osmonics Hytrex unique one-step manufacturing process continuously extrudes and thermally bonds pure polypropylene microfibers into a complex filter matrix. Microfilaments plus precise control maximize the positive filtration characteristics of graded density, tight micron cutoffs and maximum void area with millions of tortuous paths. This fully automated manufacturing process assures consistent quality, filter to filter, year in and year out. New thermal and vacuum finishing procedures produce exceptionally clean filters imprinted for easy identification in the field. The Purtrex depth filter is an exceptional value for general applications where long life, high purity and low change-out frequency are required. Produced through GE Osmonics patented melt blown microfiber technology, Purtrex is a 100% pure polypropylene depth filter with exceptional dirt-holding capacity. Purtrex true-graded density filter matrix (lower density at the surface of the filter with progressively higher density toward the center) captures particles throughout the entire filter depth. This translates to longer life and fewer change-outs than existing string-wound or resin-bonded filters. Purtrex contains no wetting agents, solvents, antistatic agents or binders, and meets the requirements of the FDA for food and beverage contact. The filter incinerates to trace ash for easy disposal. 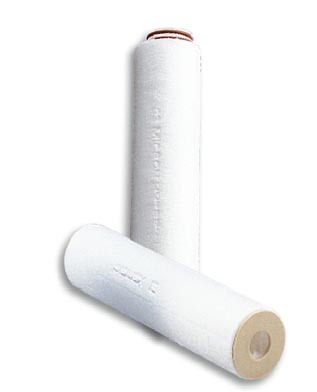 The Selex (SX) cartridge filter is a high precision graded density cartridge constructed of 100% pure polypropylene. Selex provides a very high particle retention efficiency that equates the performance of absolute rated filters. The patented Selex manufacturing process controls the density and fiber size, which are key to the filter’s performance and long life. Selex cartridge filters have sharp efficiency cutoff, fast rinse up for exceptional purity, and continuous, weld free lengths up to 40 inches (101.6 cm).